A new crew access tower rises beside a United Launch Alliance Atlas V rocket as the modifications continue to Pad 39A for SpaceX Falcon rocket crewed launches in the background. The two launch pads are being readied to support commercial crew launches for NASA. They were the sites where men left for the moon and space shuttles launched into orbit, where rovers departed for Mars and probes took off to the outer planets. Now, two historic Florida launchpads are taking shape for their new missions: serving as the off (the Earth) ramps for commercial capsules lofting astronauts to the International Space Station. SpaceX, which in 2014 leased use of Pad 39A from NASA, is preparing the former Apollo-Saturn V and space shuttle launch pad to launch its Falcon rockets and Crew Dragon capsules. Meanwhile, United Launch Alliance is readying its existing Atlas V facilities at Complex 41 to fly NASA astronauts on Boeing's CST-100 Starliner commercial spacecraft. "This is what we like to do out here," said Carol Scott with NASA's Commercial Crew Program. "We want to test. We want to touch hardware, feel it, test it, process it and put it together. And then we want to launch it. That's what is real exciting and that is what we are seeing from both of these companies." NASA's Launch Pad 39A has been steadily losing its iconic space shuttle-era configuration as SpaceX has worked to bring it up to code and modify it for commercial operations. "In an essentially a year, they've built a processing facility, finished up all the construction for their fluid and electrical systems, and they built the transporter erector," recounted Scott, who's been focusing on SpaceX's launchpad work as the ground and mission ops technical lead in NASA's Commercial Crew Program. "They've made huge strides in this past year to get [this pad] ready." When the shuttle was flying (and before it the Apollo-era's Saturn rockets), it was moved from the Vehicle Assembly Building some three and a half miles away to the pad by a crawler transporter. Standing vertical atop a mobile launch platform, the shuttle was positioned next to a fixed gantry tower and then a rotating service structure swung around to load cargo and further prepare the shuttle for launch. SpaceX is taking a different approach. The company has built a horizontal integration facility — a long hangar — at the entrance to the pad, inside of which the Falcon rockets will be processed. A transporter erector will then move the booster by rail to the top of the pad, where the Falcon will be raised to the vertical, its Dragon spacecraft or payload already mounted atop it. For crewed launches, the astronauts will board the Dragon using the same fixed service structure as was used for the shuttle, but modified for the Falcon. The gantry will gain a new crew access arm in Spring 2016 and will lose its top-mounted mast in favor of a new set of lightning protection towers positioned in a Y-shape around the pad. Further, the rotating service structure (RSS) is set to come down. "That is going to start coming down in January," Scott said, referring to the RSS. "They have the contractors [selected] who are going to be doing that disassembly and bringing that down. It will come down in pieces, it won't come down in one big chunk." SpaceX had originally said it wanted to preserve as much of the pad's historic structures as possible, but leaving the no-longer-needed RSS in place would pose a safety risk, noted Scott. "It is a maintenance kind of issue, a [foreign object debris] FOD issue," she explained. "In this [sea air] environment, it does not take long for corrosion to begin happening. Then you create some type of FOD that would be damaging to your rocket during launch." The RSS and other hardware removed from Pad 39A will be returned to NASA for artifact screening and disposition. SpaceX is intending to launch its first Falcon from the pad next year. If the schedule holds, the first spaceflight of the Crew Dragon, albeit without astronauts, could lift off from Pad 39A by the end of 2016. "We just got through a couple of weeks ago — just before Thanksgiving, doing an evaluation of the pad, all their fluid, electrical and mechanical systems, [and] also their launch control system, and have given it an okay to move out of the construction phase into where they are ready to begin processing," Scott described. "They're ready to have a first stage piece out here and start doing some processing." Renderings of United Launch Alliance's Atlas V crew access tower and SpaceX's modified-for-Falcon-rockets Launch Pad 39A. 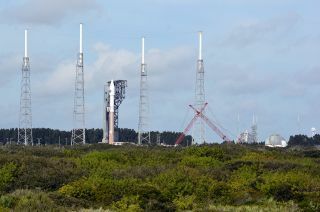 Similar progress is being made about two miles away at ULA's Atlas launchpad located at the Cape Canaveral Air Force Station's Complex 41. "We started construction with a ground breaking just after the first of the year and basically, in the past 11 months, you can see all we've done," said Howard Biegler, ULA's launch operations lead with the company's Human Launch Services group. "That's all the foundation work, well over a thousand cubic yards of concrete, and well over a million pounds of steel have been erected at this point." The 201-foot-tall (61-meter) tower is the first new gantry to support astronauts at the Cape since the fixed structures were erected at NASA's pads 39A and 39B more than 30 years ago. ULA's crew access tower will enable astronauts to board Boeing's CST-100 Starliner spacecraft to launch atop Atlas V rockets. "One of the things that we have instilled with Boeing is that we do not want to change the way we process the rocket because we have a formula that works," said Biegler. "It is very successful, it is very succinct, and we understand it very well." The crew access tower and the time Boeing has to work with its CST-100 Starliner atop the Atlas V will be the only major differences between crewed flights and ULA's other satellite and spacecraft launches. The tower was constructed mostly offsite and then stacked in place to allow ULA to continue launches in the interim. "The major components of the tower, which we call tiers — the center body — was constructed four miles up the road starting in April this year," Biegler said. "These tiers were outfitted and then we brought them here and erected them piece by piece." "Much like kids had erector sets, that's exactly what we did here," he noted. Work is now underway to finish the tower. A crew access arm, now being tested offsite, will be moved into place in the May-June 2016 timeframe. ULA expects to have the access tower all ready to support crewed launches by Oct. 15, 2016. Boeing's schedule calls for the first CST-100 Starliners to fly in 2017. See more photos of SpaceX's Pad 39A and ULA’s crew access tower at collectSPACE. Follow collectSPACE.com on Facebook and on Twitter at @collectSPACE. Copyright 2015 collectSPACE.com. All rights reserved.